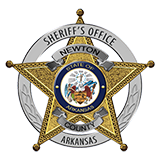 Newton County Sheriff Keith Slape said that the body of David Hadlock 54, of Springdale Ar, was recovered in South West Newton County, Sunday afternoon. Hadlock hadn't returned home and his wife asked for a check. A National Park Service Ranger located his pickup at a trailhead. Newton County Sheriffs Office along with Newton County Search & Rescue, National Park Service and U.S., Forest Service located and recovered his body at Magnolia Falls.